Literally awesome. I’ve always be really interested since I was a kid. Not surprising I guess, given the other types of things I really love. So, this weekend I went back up north where you can actually see stars with the naked eye, and I was having a good peer through the Celestron Astromaster 70AZ telescope we bought for my mum’s partner; As you may or may not know, Jupiter is really bright at the moment, and at 90x magnification I could even see the Northern Equitorial Belt, and the four largest so-called ‘Galilean moons’ Io, Europa, Ganymede and Callisto (hint: they were discovered by Galileo). 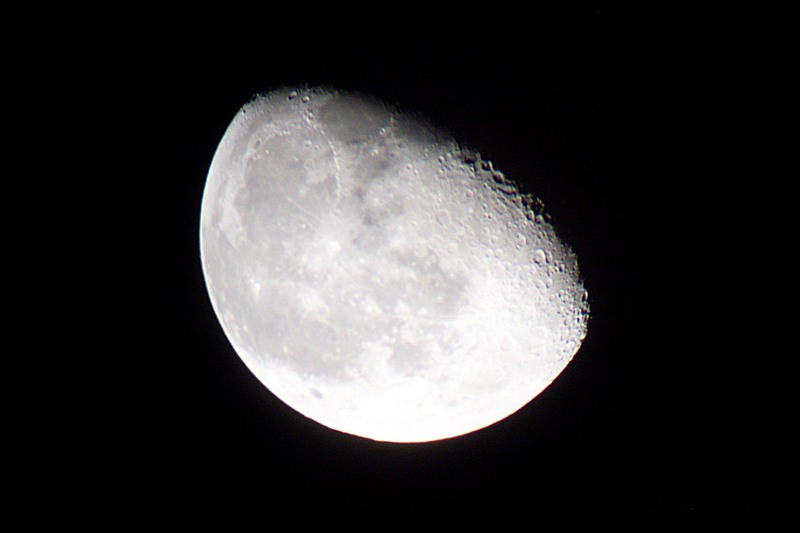 I also saw – as one would expect – the moon, which was extremely clear on the two nights I was viewing. On the second night I managed to get a few photos using my sister’s digital camera (harder than you’d think), one of which is the above, the rest are here on flickr. Pretty impressive stuff. I also went to see my grandparents that weekend, and my Granddad being very interested in such things, I told him and showed him a few of the photos I’d taken. When I was a kid, and we stayed at my grandparent’s house, I remember frequently pestering my Granddad to get his telescope down from the loft. I used to love it, peering into the lens of this instrument, a window into the vast, black unknown in which reside planets, stars and galaxies of ages and sizes that are hard for us mere humans with our feeble 80-odd year life-spans to comprehend. I truly think experiences like this are instrumental to my love and wonder at the complexities and general awesomeness of the universe in which we live. Anyway, so whilst talking with my Granddad, he mentioned the old telescope, and basically said he’d been trying to return it to the observatory from whence it came – as it was slightly dilapidated and he hadn’t used it in years – but if I wanted it and could house it, it was mine. I had forgotten but it’s actually better than I remember, a Charles Frank 6″ motorised Newtonian reflector. He told me it needs the mirror re-aluminising, but other than that, as far as he knew it was in working order. We popped out to the garage to check if the motor was still going, and sure enough it whirred up into life. Amazing. I almost immediately set about looking for places in or near London where I could get the mirror sorted, and found a couple of candidates. (Later still I found somewhere that would do it for about £40 – a very small price to pay for something so brilliant). So, at some point, I need to convince my parents to bring it down to London for me, but in the mean time I’ve been doing some research. I couldn’t find anything about my specific model although this one is very similar. I did find however, that it’s probably about 40 or 50 years old. 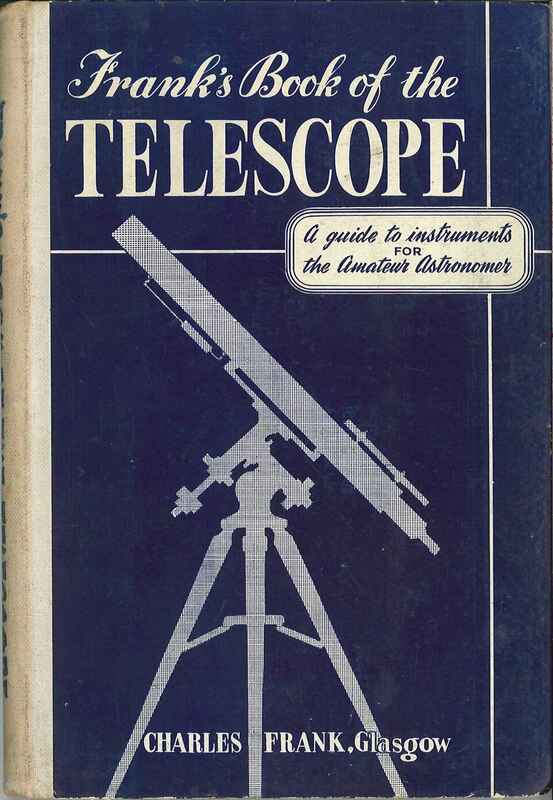 I also found a book written by Charles Frank called ‘Frank’s Book Of The Telescope’, a book explaining telescope basics for newcomers – which I duly bought from Amazon Marketplace for the princely sum of one pence, plus a huge £2.75 p&p. A quick note – before any of the more cynical astronomers among you start telling me it’s pointless trying to see stuff in London – I know what you’re about to say. However, I’m hopefully going to have this telescope for a long time, certainly longer than I’ll live where I am now. It’s an heir loom, of sorts, and has a history attached to it. Plus, I’ll be able to see some stuff – just not as much – and the further I get away from the light pollution, the more I will see, so it’s an investment for the future. Here’s to some future stargazing. I’ll leave you with some awesome, humbling, inspiring words from Carl Sagan, whom I consider a personal hero, and one of the greatest people who have ever lived. Powered by WordPress v 4.3.19. Page in 0.051 seconds.